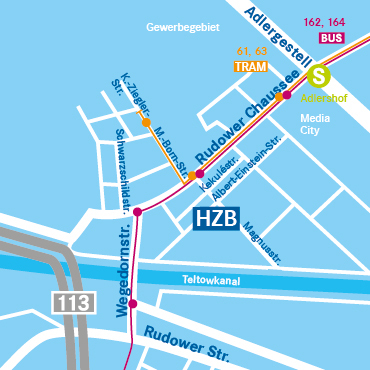 HZB WRC Campus Adlershof can be reached by bus or tram from S-bahn Adlershof (S8, S9, S85, S46, S45) taking either the 162 or 164 bus or Tram 61 or 62 and stopping at Magnusstr.- and then walking 2 minutes down Magnusstr. Alternatively, it is a 10-12 minute walk from the station via either Rudower Str. or Albert-Einstein-Str.